What is your favorite stamp for 2016? Share your opinion by voting in Linn’s 2016 U.S. Stamp Popularity Poll. 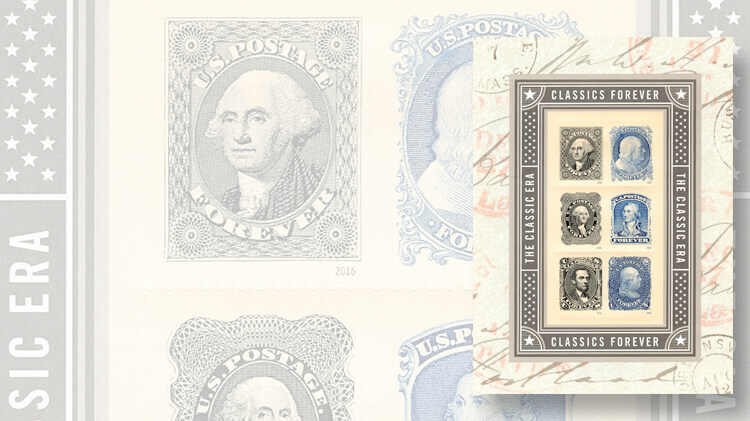 The deadline is fast approaching for Linn’s 2016 United States Stamp Popularity Poll. All ballots must be postmarked by March 1, and online voting will end at midnight March 1. Voting in Linn’s stamp popularity poll is a fun way to let the world know your opinion of the stamps and postal stationery issued by the U.S. Postal Service. We encourage stamp clubs to use the poll as an activity at their meetings. During your February meeting, distribute photocopies of the ballot that appears on page 42 of this issue. The poll is likely to generate some lively discussions centered around club members’ favorite or least favorite stamps of 2016. For example, what do your members think about the Wonder Woman stamps? The five Soda Fountain Favorites forever definitive stamps are fun and attractive, but do your members believe they are really necessary. Vote online in 2016 U.S. stamp popularity poll: In 2016, the United States Postal Service issued 154 varieties of stamps and postal stationery. Which ones caught your eye? We ask that stamp clubs submit their ballots in one envelope with the full name and location (city and state) of the stamp club. We will mention clubs that participated when the results of the stamp poll are reported later this spring. We also encourage young stamp collectors to vote in the poll. If they vote using a printed ballot, we ask that they let us know by indicating on the ballot that they are under age 18. We keep a tally and report on the number of participating youths, youth stamp clubs, and schools in our poll results. Of course, we have no way of tracking how many youngsters vote in the online poll. The youth votes are counted equally with votes for participants over the age of 18. We track their votes simply because it is interesting to know how many youngsters participate and how they view the U.S. stamp program. Last year, the set of 10 stamps titled A Charlie Brown Christmas was hands-down the winner over the other 32 stamp and postal stationery issues in the 2015 stamp poll. The set also was chosen as the best definitive stamp design. Year after year, collectors choose stamp issues or sets with multiple designs rather than a single-design issue. Last year, Linn’s received a total of 1,477 ballots, and more than 580 readers voted online. Cast your vote online today, and you can view the current 2016 poll leaders. A link to the poll can be found here. If you are mailing your paper ballot to us, please send it soon.